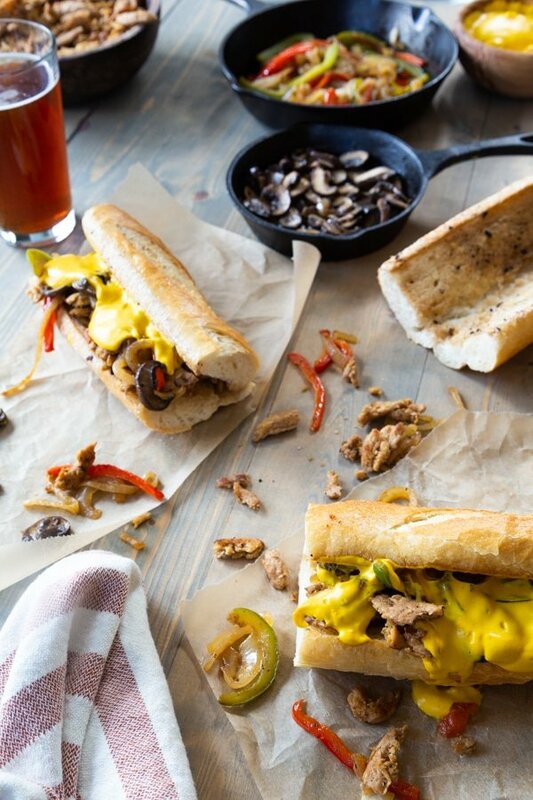 When you’re craving a Philly Cheesesteak and you’re a vegan, don’t despair, we’ve got you covered. 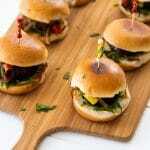 Our vegan version of this sandwich is so meaty and full of melty cheese and flavor, once again proving, you don’t need meat to eat your old favorites, you just have to be creative. When we started Veganosity, five years ago, all we wanted to do was recreate our old favorites. This oldie but goodie, was really an OLD favorite, because I hadn’t eaten cow in over three decades. And Alex never has, so she had nothing to compare this vegan Philly cheesesteak to. But you know what? 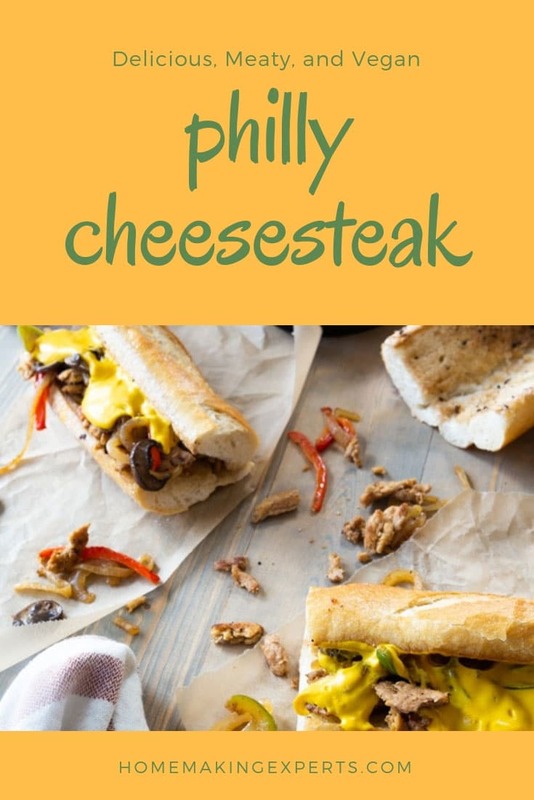 Even though I hadn’t had one of these steak and cheese sandwiches in decades, I still recalled the flavors and textures of this delicious sandwich. WHAT IS A PHILLY CHEESESTEAK? In case you’re like Alex, and have never had one, let me walk you through it. 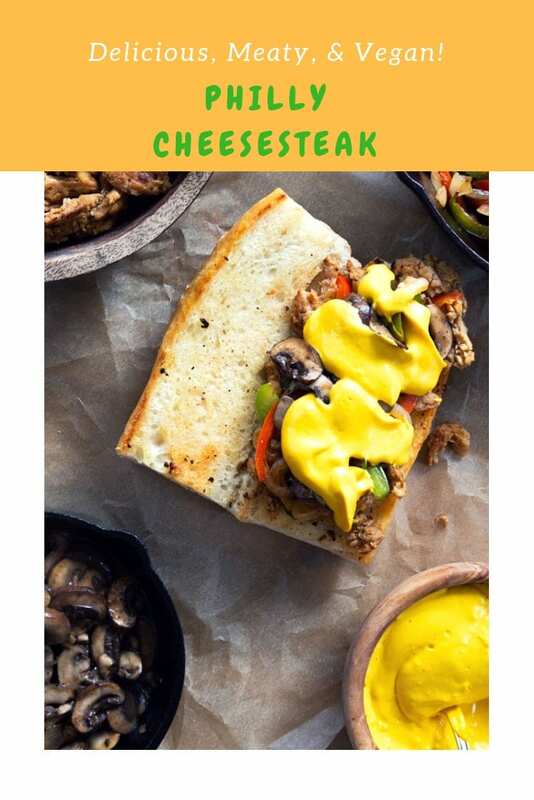 An authentic Philly Cheesesteak is thinly sliced beef with thinly sliced sauteed onions, peppers, and mushrooms, topped with melted cheese, all stuffed into a long hoagie roll. The sandwich originated (so they say) in Philadelphia, PA, hence the name. 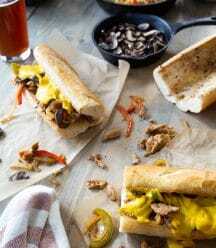 HOW DO YOU MAKE A VEGAN PHILLY CHEESESTEAK? It took us a while to narrow down the meat substitute for this sandwich. We wanted something that would soak up the flavor of the no-beef broth and have the chewy texture of steak. What did we finally declare the winner of this great sandwich? Soy Curls !! If you’ve never eaten or cooked with soy curls, let us introduce you to this genius product. Soy curls are made from whole soy beans that are dehydrated. We buy Butler Soy Curls because they’re non-GMO. Click HERE to buy. When you soak them in a marinade or broth, they drink up the flavor and re-hydrate to a chewy and firm texture. This is why we chose to use them for this recipe redo. 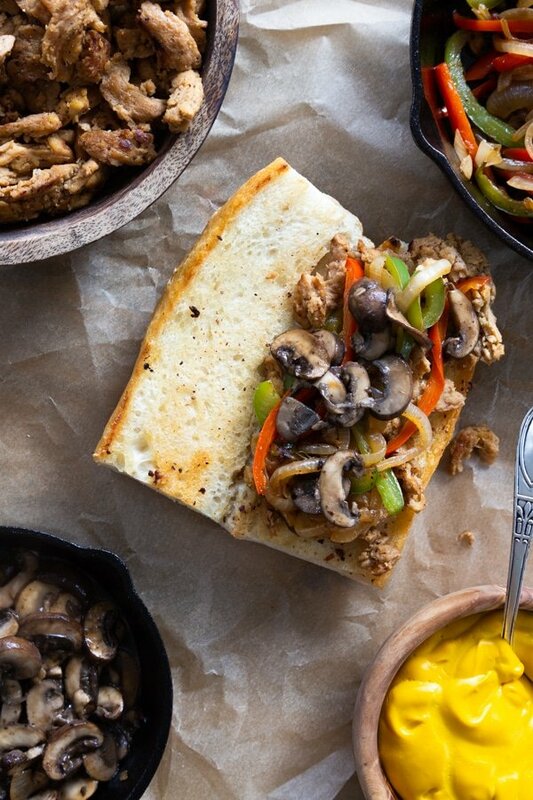 To make this delicious vegan steak & cheese sandwich, here’s what you’ll need to do. 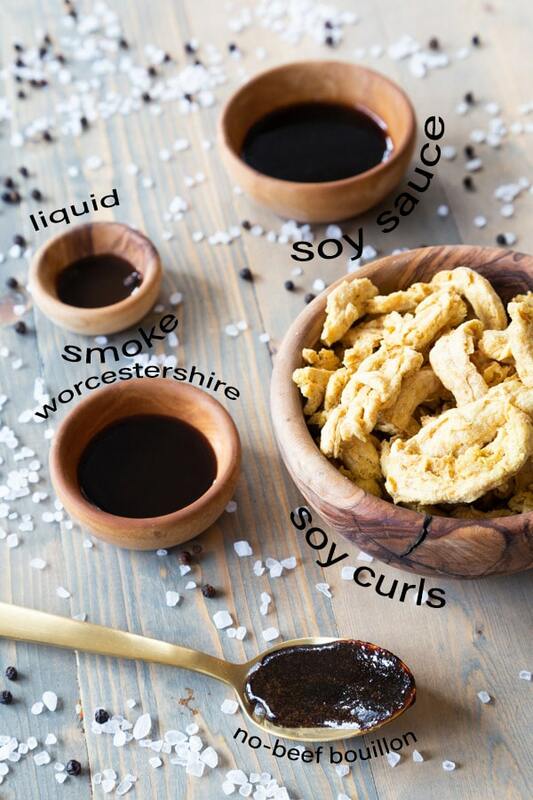 Marinate the soy curls in vegan Worcestershire sauce, liquid smoke, no beef bouillon broth, water, and soy sauce until they’re rehydrated, approximately 30 minutes. 2. 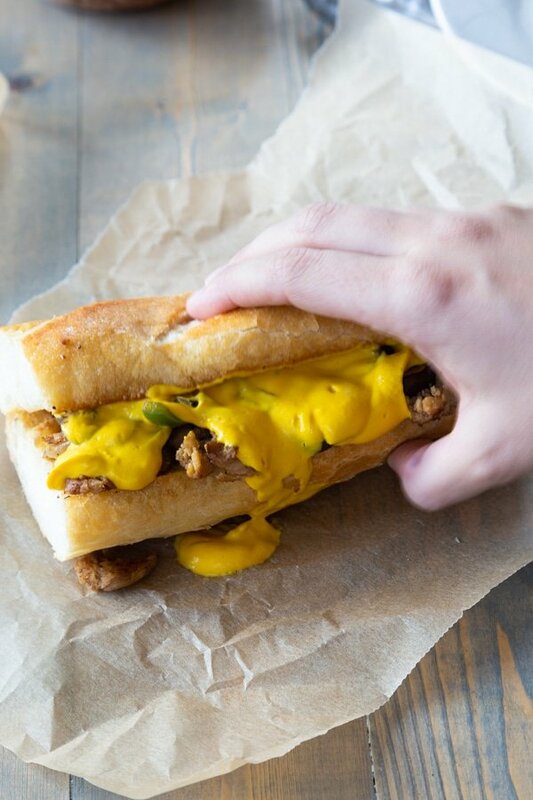 While the soy curls are soaking up the broth, make the cheese sauce. and start sauteing the onions, peppers, and mushrooms. 3. Drain the excess liquid from the soy curls and cook them in a hot pan for approximately 10 minutes, or until they begin to get slightly crispy on the edges. 4. Start building the sandwiches. Start by toasting the bread then add the soy curls. Next add the onion and pepper mixture and the mushrooms. Now smother the whole thing with as much cheese sauce as you want. 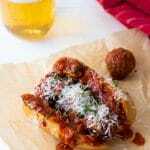 We go one step further when we make our sandwiches and grill or toast the rolls with a little bit of olive oil. This adds so much flavor and extra crunch. 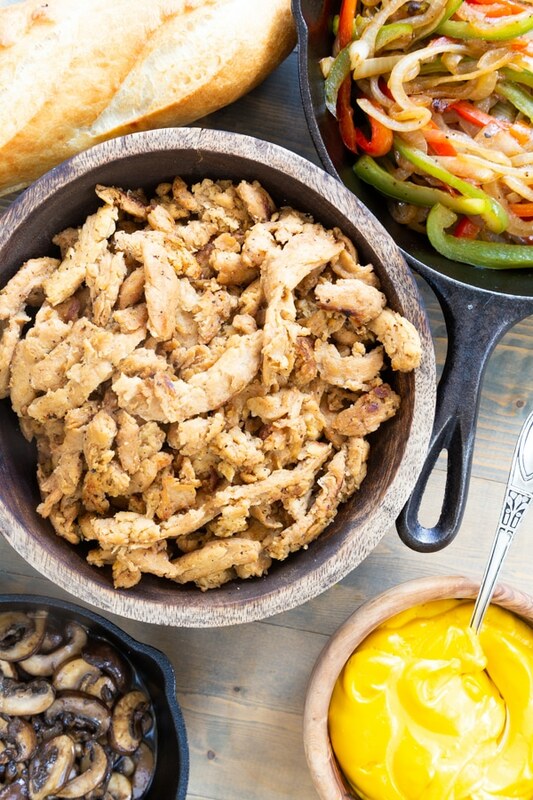 If you’re looking for something to serve for game day, this is it. Place the onions and peppers, mushrooms, soy curls, and cheese sauce in individual bowls and let your guests build their own. Serve these with our Quick and Easy Oil-Free Chipotle Home Fries. 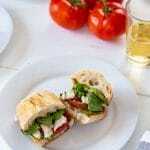 Our vegan version of this classic sandwich is so meaty and delicious. 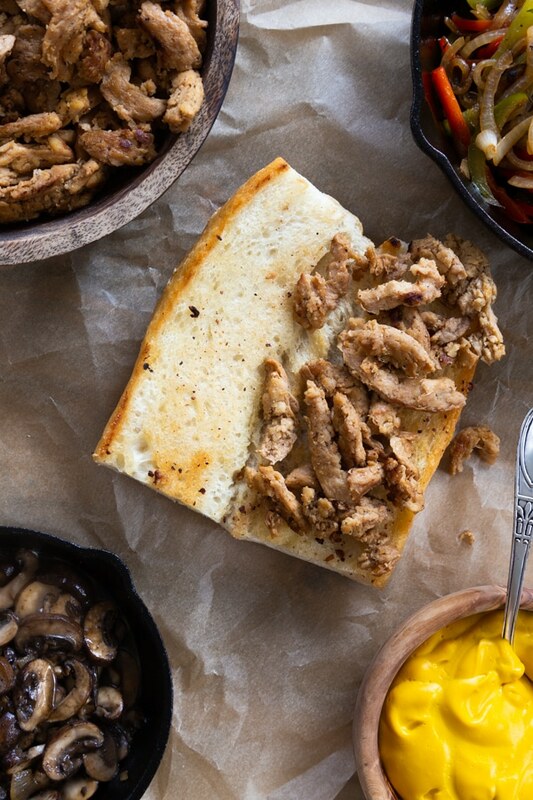 The perfect alternative to a beef Philly Cheesesteak. 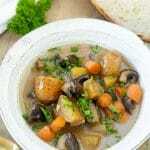 Pour the boiling water into a large bowl and Whisk in the bouillon paste, Worcestershire sauce, soy sauce, and liquid smoke until well combined and the bouillon paste is completely liquified. Add the soy curls and stir until they’re completely coated in the broth and let marinate for 20 to 30 minutes. Click here for the cheese sauce link. 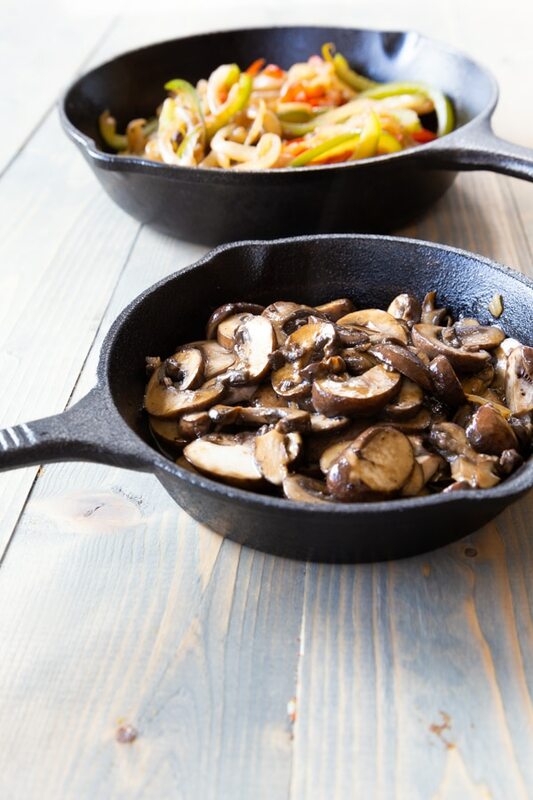 Heat a large iron skillet or whatever large sauté pan you have, on medium-high heat. 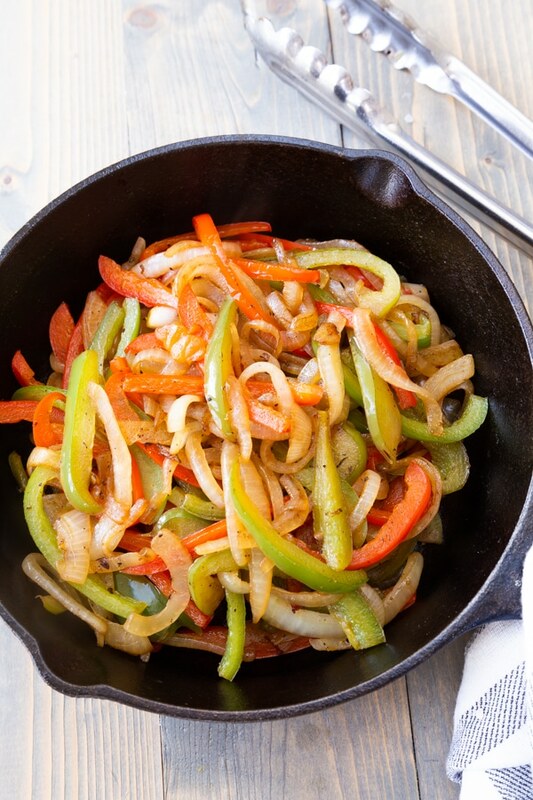 When the pan is hot, melt 2 tbsp of the butter and add the onions and bell peppers. Stir to coat with the butter and reduce the heat to medium-low. Cook the onions and peppers, stirring often, for approximately 15 to 20 minutes, or until they’re nicely caramelized, salt and pepper to taste. Remove from the pan and set aside. Heat the pan back up on medium-high heat and add 1 tbsp vegan butter and let it melt. When the butter is melted, add the mushrooms and stir until coated in the butter. 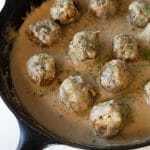 Cook, stirring often, approximately 10 minutes, or until the mushrooms have lost their water and are a nice golden brown, salt and pepper to taste. Remove from the pan and set aside. Drain the liquid (reserve 1 cup) from the soy curls and press out the excess broth. Add to the hot pan and cook for approximately 5 to 7 minutes, or until the edges are crispy and brown. Add a bit of the broth to deglaze the pan and let it evaporate. Stir often. Salt and pepper to taste. Grill or toast the bread if desired. We suggest spreading a thin layer of melted butter or olive oil on the inside of the bread before toasting. Build your sandwich. 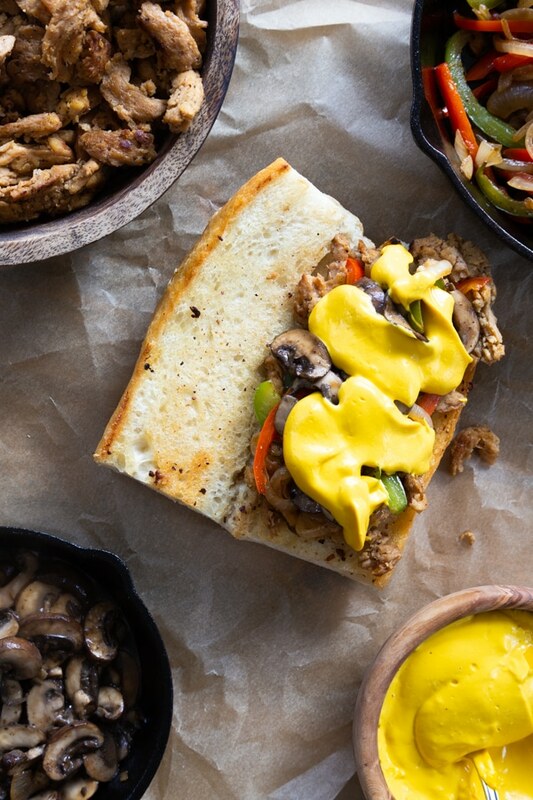 We like to start with the soy curls, then the veggies, and top it with the cheese sauce. This looks amazing, I want to go buy soy curls right now! My husband would love this, thanks! Thank you!! My husband really enjoyed these. Let me know if you make them. I need to get into Soy Curls more!